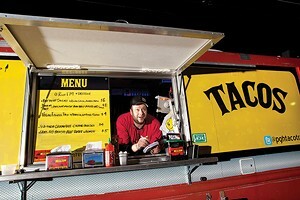 It makes sense that the first winner in the Best Food Truck category would be the Pgh Taco Truck. After all, the truck represented a movement even before it started moving. "I started a blog in 2010 called Burgh Gourmand and at that time, I committed digitally to opening a food truck in Pittsburgh," says Pgh Taco Truck owner James Rich. "At the time, there was less than a handful of gourmet food trucks, and I asked people what they thought and what they'd like to see. So in 2012, I bought a truck and started doing events." Rich started getting solid word-of-mouth reviews from customers who had the chance to sample his gourmet tacos. In January 2013, the truck opened for business several days a week at different spots around the region. The truck's offerings aren't your run-of-the-mill tacos. You can find tacos with ground-beef filling, of course: a third of a pound of Angus beef served with cheddar and salsa or queso fresco and cilantro. But there are other choices as well, like spicy jerk chicken with avocado cream. There's also a daily vegetarian option. Despite its name, Pgh Taco Truck is active mostly in the North Hills, where it frequently operates in the parking lot of Coffee Buddha (964 Perry Highway). The suburban location is largely due to the city's restrictive rules about where food trucks can operate. "When I was building my business plan, I became aware of the city's restrictions, so I wasn't getting into it blindly," says Rich, who lives in Bloomfield. "So the idea became to build my business at locations outside of the city, and through private events." But Rich has built up a customer base that apparently doesn't mind traveling from all over the region to the North Hills. Rich says his arrangement at Coffee Buddha has been beneficial to both businesses. On the days he sells outside the store, he doesn't sell drinks, directing customers inside the coffee shop instead. "This arrangement has really been an integral part of our success thus far," Rich says. "There's just this lovely symbiosis." "At first I think people started coming because we were like a novelty," Rich adds. "But as they tried our food, they enjoyed it. And I think they appreciate the effort that we put into it, and see that it's on par with food they might get at a restaurant." "But beyond that, I think our customers feel like they are supporting a movement," he says. "I've spoken a lot about the process of how we got here, and I think people are connected to our story."